The Super Bowl is a day that most people probably love, but I am not really one of those people. For some reason, I never really got into football. 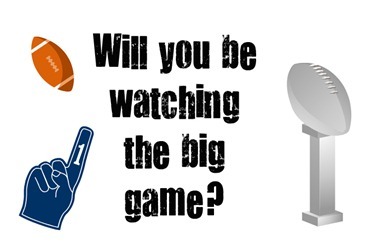 Living in the land of the Giants and not far from the Patriots, I watch as everyone goes Super Bowl crazy. Growing up, my father was a San Francisco 49ers fan. While my brother learned to like the game, I preferred to watch commercials on this big day. Classic commercials like the ones with Michael Jordan and Larry Bird for McDonalds still bring me back to the good old days of Super Bowl ads. Over the last few years, I could hit or miss watching the Super Bowl. The ads in recent years have gotten mostly cheesy and leave me forgetting what they are really about. This year, advertisers have also leaked out a lot of the bigger ads before the big day. I will admit, this one from Honda made me smile. Yes, bringing back Ferris Bueller’s Day Off in a spoof was brilliant for the new CRV. It made me smile and remember the good old days. So today, while everyone gathers around watching the Giant and Patriots battle, I will be spending time with my boys and when it is time for the half time show, I will be rocking it out with them and of course Madonna. So how will you be spending Super Bowl Sunday? I love that commercial – and I love Ferris Bueller. I can get in to a good super bowl party (food, drinks, commercials…) but since having kids, I usually find something else for us to do since my husband has a long-standing poker game/super bowl party he goes to. I may tune in to watch half time (wait — did I already miss it? )… or not.